Pictured are Bob and Ida List of Bob List Photography. INDIANA — Bob and Ida List of Bob List Photography recently attended the 100th-anniversary meeting of the Daguerre Club of Indiana in Nashville. The meeting coincided with the opening of the 100th Anniversary Gala Exhibit of the Daguerre Club at the Brown County Art Gallery. The exhibit will be on display until the end of March. Bob submitted some of his family portraits for inclusion in the exhibit and they were accepted. These were portraits from Bob’s regular portrait client sessions. One of the images is of Luke and Amber Blakesley and family during a playful moment in the front yard of their home just outside of Milford. One of the unique things about the Blakesley’s is that they raise camels and make specialty soaps from the camel milk. Another portrait features the Harry and Barb Gigous extended family in front of their vintage “Chevys.” The running boards and truck bed of the old vehicles were the perfect posing aids for a photographer but the classic lines of the vehicles in addition to the happy expressions of the family is what made the photograph. Harry and Barb have shown their cars in many car shows across the midwest. Jake and Ashlee England family are also featured on a crisp fall afternoon along with a comfy portrait of a young woman and her dog. 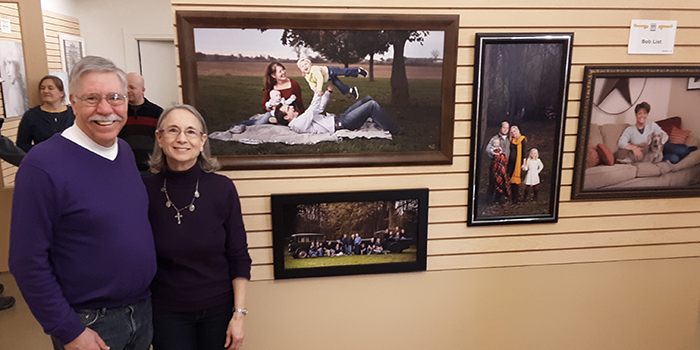 Bob and Ida have been blessed with running their portrait studio since June of 1982. Most of their patrons come in as clients but they always leave as friends.